Gidgegannup’s Angela Whife said 170 sheep, six alpacas and a calf had all been mauled or killed in the district in the past year. The attacks occurred at 12 properties. 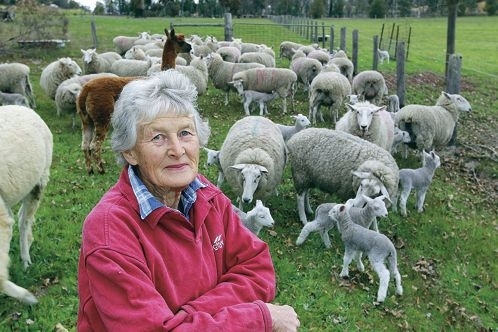 ‘We personally have lost eight border leicester stud sheep ranging from six- month-old lambs to ewes,’ Mrs Whife said. She said one of her stud sheep was worth between $500 and $1000. ‘People must contain or restrain their dogs at night and during the day if they are not at home,’ she said. A group of residents is distributing leaflets urging dog owners to be more responsible. They contain graphic images of mauled and disembowelled sheep. Judith Edwards, from Hovea, said their had been similar incidents on her property. Last month, she went away for a family celebration and when she returned the next day her two alpacas and five geese were dead. ‘The two dogs that caused this disaster were still running around the property feeding off the animals,’ she claimed.